Penny Smith is quitting GMTV after 17 years on the sofa. The 51-year-old's departure comes amid plans for a re-vamp for the breakfast news show and follows weeks of speculation over the future of GMTV's presenters as commercial broadcaster ITV faces tough economic challenges. She said: "It's an ideal time for me to say goodbye to early mornings. "Now that the format has changed, I have taken the plunge and am moving on." GMTV's managing editor Neil Thompson said: "Penny has been a welcoming and familiar face on Britain's breakfast screens for many years. "She has become a hallmark of GMTV's presentation, not only on the sofa but also as a newsreader. 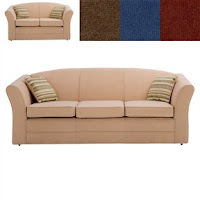 Prices start from only £214.99 for this Contemporary Milly Sofa, available in 2 and 3 seater options and 4 colour options.